We provide Qigong classes for beginners, intemidiate and advnaced practitioners, also for medical professionals, like acupuncturists, massage thearapists, etc. Please find the detailed info in this page. Can you belive, you can practice qigong while driving, chatting, sitting, even working, without distraction? Do you know that regular people breathe for survival, a qigong practitioner berathe for better health and longivity? Have ever realized that regular people enjoy the blue sky, beautiful flowers, mountains, rivers, oceans, sunshine, moon light, etc, just for viewing, a qigong practitioner can invite the energy from these views to his body to get more "nutrients", enrich his body? Oh,Oh, what a waste of the universe! Food is not the only resource of energy to human being, we have unlimited "qi" open for us all the time. For any one who don't have any qigong background, knowledge, but he is interested in qigong, or he intent to improve his health fundamentally, quickly or conviennently, he can take Yuan Gong Class. We teach Qigong philosophy--what is Qi, nature of qi, the qi manipular systems in our body, desciplines of qigong practice. Healing techniques including: Drawing negative (pathagenic) qi from our body, applying positive (fresh/pure) qi to the corresponding organ(s), you can see the effect right away, pain get subsided, stress get releases, ... it is all natural, without medicine, even without touching one's body. Everyone can learn it, even you are completely beginner. You may heal yourself, or heal others. 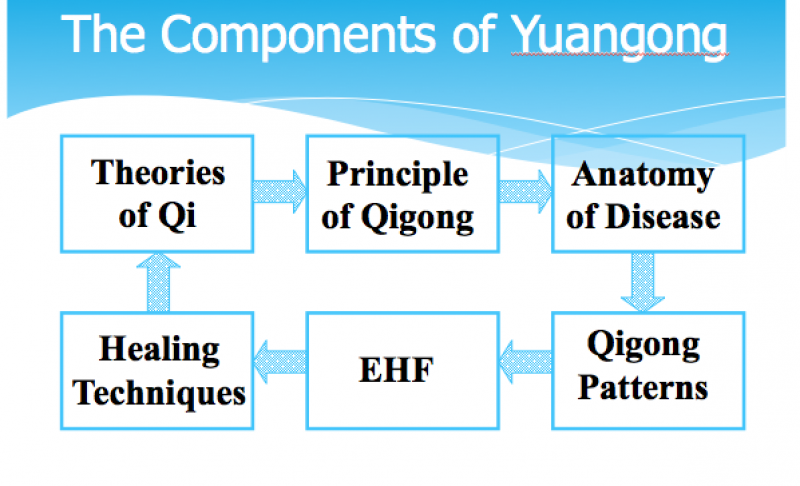 Qigong Diagnosis: Hand sensing, aura reading and clairvoyance. You will learn how to make diagnosis with your hand, without touching the body, you can identify the energy condition vs health condition. Aura, just like hilo around one's body, it is always there, but to common people, it is invisible. If you are trainied, you can see it, which indicated one's energy level, health condition and his emotion/mood. Clairvoyance, a person has developed clairvoyance, he can "see" through one's body to find out the qi condition, physical organ condition and the prognosis of his/ her health. And it can develope one's intuition, deep insight of the causes of certain disorders or diseases. Movements: If you don't have time do do exercises, don't worry, Yuan Gong sixteen movements can help with you. You can practice any time, anywhere for as long as you like. These movements are not just movement, they can cultivate your internal potential power, energy--vital qi, for blancing your body, more energetic and make you younger than your age. Following the demonstrations of Qi manipulation, two of Dr. Yang’s students performed beautiful music. First up was author and Tibetan translator, David Molk. 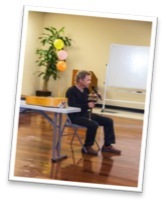 David sang two beautiful songs while playing his guitar. David drives about three hours from his home in Big Sur to be treated by Dr. Yang. Prior to evening coming to an end, Dr. Yang talked about the importance of Qigong and taught audience members various qigong movements. He also explained how remote healing works and invited everyone to join him in a group healing. 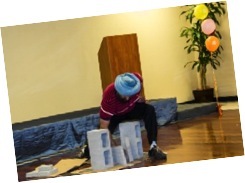 The Qigong Night was a huge success! If you were not lucky enough to attend, we really hope to see you next time. Detailed instruction of Gallbladder Meridian, the natures of all the points, the functions to activate the points, the effect of stimulating the points, etc. Detailed instruction of how to treat Digestive Sickness by Awakening the Meridians, including H-pylori, Stomach bloating, cramping pains, indigestion, Gastritis, Regurgitation, Stomach Bloating, Acid Reflux, slow absorption, etc. Dr. Philip Yang (the founder of “Awakening Meridians”, he will teach all the techniques and secrets of activating points and channels). Purpose: To grasp more philosophy and techniques, improve the power of Qi manipulation, develop further potential abilities, and improve our spirituality. 4) Wu/intensive mode of practice. 5) Levels of third eye. 6) Avoidance of seeing, telling and interferences. 1) Where is the spiritual power generated? Jing Luo (Meridian) is a myth for over 5000 years, not only for westerner, even for acupuncture practitioners, they might not be able to explain what is Jing Luo, why it works, etc. The concept of Jing Luo is beyond the science, but partially, we do can find some clues and apply the philosophy in our daily life or practice. 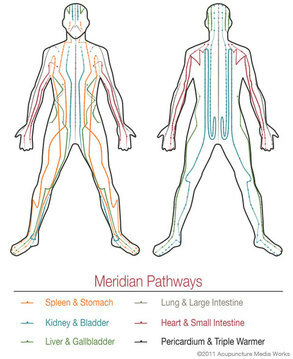 Jing Luo is a treasurable science of Chinese medicine, there are total 12 main meridians and many branch meridians, connecting to all the internal organs and limbs, to maintain the basic functions of them. This means, without meridians, or if some of the meridian are blocked, there will be problem(s) corresponding to the organs or tissues. It is commonly stated, “Blockage mean pain, pain means blockage”. (from the “Holy Bible” of Chinese Medicine--<Nei Jing>). Eyes can see because the meridians connecting to the eyes are open or smooth, which are stomach meridian, urinary bladder meridian and gallbladder meridian. If one of them is blocked, for example, if gallbladder meridian is blocked, the person will have blurry vision, etc., If you know the truth of meridians, and you know how to re-activate the channels (meridians), you will be able to treat various sickness or disorders. There many ways to re- activate the meridians: acupuncture, moxa, massage, acupressure, ... , but there is a way that common people don’t know-- “Awakening Meridians” This is based on the understanding of the nature of meridians, such as the frequency, directions of Qi flow, the resonance of the meridians etc. You will be very surprise, with a small hammer, gently tapping the body, you can make a bump “disappear”, you can make pain goes away, you can make the spine aligned just in a few minutes, even it is crooked. Traditionally, for this problem, you have to use a lot of strength, hours and months to rub, shake, pull, stretch,... to work on it properly, otherwise, it doesn’t change. Starting from 10-22-2017, within 3-4 weekends, we will teach this technique to the public. It will be the first time to disclose one of the secret of the meridians.